Stock market data becomes more valuable as it essentially delivers an opportunity for traders who seek analysis and statistics. As stated earlier, Pusher will be used to easily deliver the realtime functionality necessary for our chart to function as specified. If you don’t have an account with Pusher, you can sign up for free. Once you are done, go ahead and create a new app from your dashboard. 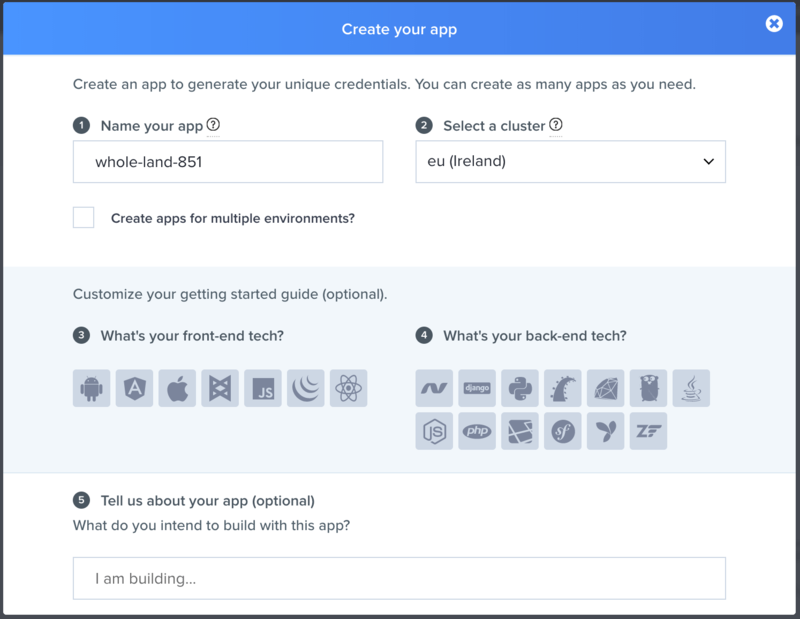 Don’t forget to take note of your app_id, key, secret and cluster as you will be required to use them later in this tutorial. Now edit the file above by adding the script to start our local server, we will set this up in a bit. We also need some existing dummy data in order to create a proper simulation of stock trades and price variations. For this reason, I downloaded a data sample of previous stock history we can play with. Below is the truncated version of the stock.json. You can find the complete file here. Within server.js, import the stock``.json file and initialise Pusher with the required credentials obtained from the application dashboard. Every 2 second, we query the JSON file for GOOG stock prices and and emit this price alongside some other payload (like the stock name) as JSON using the Pusher’s trigger method. This method takes channel, event, and payload as arguments. You have a canvas where you will launch the chart as well as a simple table to show the current prices as they are updated in realtime. We also included the Pusher and Chart SDK which we will use soon. We just created the methods bodies. Next is to start implementing their functionalities one after the other. For debug purposes only, we are setting Pusher.logToConsole to true so as to see the realtime activities logged to the console. Remember to remove that in production so you don’t leave your user’s console bloated with debug logs. Next, we create an instance of Pusher. The constructor function is available in the pusher-js file we included earlier. The subscribe method on Pusher takes a channel we need to subscribe and returns a subscription. We can then bind to this subscription using bind and passing it the event’s name and a callback function. It might look overwhelming, but a closer look shows that we are just defining a chart and describing what kind of data it should expect, how it should label the data, and how it should look. Now, the update chart method uses the chart instance to update the chart every single time data comes in from the Pusher server. At the moment, thanks to Pusher’s functionality, we are able to update the chart in realtime with the payload sent in by the server. Let’s proceed by adding another feature to display the prices on a table. We will choose a random price to be set as a threshold in order to determine when the price increases or decreases as it is being received from the server. These changes in prices will be indicated with different colors as it is obtainable in any stock market chart. To make this work we will edit the updateChartData() method and also create a new one called flashColor``(). The new method will be used to change the colors based on the changes in prices. From the chart, the green color for prices means that the price has gone above the threshold while red indicates reduction in price and blue means it is exactly the same as the threshold price. From this tutorial, we have seen how to build a stock market like platform where changes in prices are being updated in realtime. This can be built upon and used with any chart library. In case you miss anything, the complete code can be found on GitHub. You can find it here and please feel free to submit a pull request.